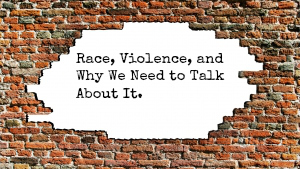 September 2014 Synchroblog: Race, Violence, and Why We Need to Talk About It. Issues of race and violence have crossed over the centuries. It’s embedded into human history and sometimes we think we’ve come further than we have. The events in Ferguson are not just about Ferguson. They tell a bigger story, a story of racism and violence and power and division that is reflected not just in that one town in middle America but in neighborhoods, cities, the church, the world. This month the Synchroblog will create a space to share our reflections about Race and Violence and Why We Need to Talk About It. What is bubbling up? What do these current events stir up in our own life and faith? Why are these conversations so important? How can we be better participants in the conversation? We will be hosting this the 4th week of September instead of the third, so post by midnight on Tuesday, September 23rd. Post your link here in the comment section as soon as your post is up. We will combine all of the links and post it on Wednesday morning, September 24th for everyone to share at the end of your posts. hi heather, for some reason i couldn’t get the link to work and didn’t see it on your blog. can you re-post it to us?